There are track saws, and there are track saws. For a $200 estimated price tag, this Grizzly T10687 does it’s job wonderfully. This is similar to Sheppach and other European clones of this economical track saw type, but is Grizzly :) It has a riving knife, it plunges, 9 amp motor, dust port, has a 100% functional depth knob, no wobble in the track. All knobs are plastic, but that hard plastic, not the flimsy type. I can easily plunge it with one hand reaching across 4’ plywood panel. I would give it 5 stars, except the dust collection is average. The track itself is great and has 3 strip “gripper” material on the underside. You can get the accessory pack of clamps, but I have yet to really use them because those underside grippers work great. There are complaints the green sliding material is too close together (easily modified to relocate the strips) but I have not found a need to. 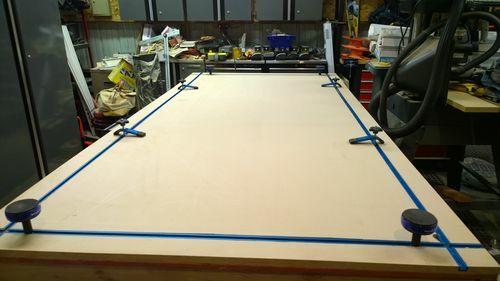 Easily went to work on 3 4’x8’ 3/4” plywood this Sunday with no problems (I need a longer shop vac hose so did not use dust collection this time around). I am still using the Grizzly factory blade with I have had surprising good results. Always the option to swap out to Diablo’s later. How’s the accuracy? Is it good enough to build cabinets/cases/built-ins? Do you find yourself re-cutting your sheet goods on the table saw? Or does the track saw get your cuts close enough? The accuracy is 100% spot on. That black edging strip to the right you see in the track picture is your guide. Foolproof. I would much prefer a cabinet saw for repeatable cuts and ease of use. Setting up for accuracy means you have to have patience and double check the lineups. Thanks for the review. I have been considering this saw for rough breaking down of sheet goods (prior to running through the table saw). One of the complaints other reviews have is the chipping along the cut line. What is your opinion? Thanks for the reply. I have a contractor saw with limited rip capacity…..so I’ve been considering a track saw to supplement the table saw, particularly with sheetgoods and panels. I’ve been waiting for the Makita to drop to $325-350, but that apparently will never happen. So less expensive options are now up for consideration. You can see in the above picture using the STOCK Grizzly saw blade. JMARTEL has home brewed modifications for zero clearance cuts with even more impressive results. Ted, I am in the same boat with a Bosch 4100: limited rip capacity. I would use a track saw to rough cut sheet goods and then finish off on a cabinet saw (that’s the plan til I get a cabinet saw). Luckily, this track saw works great albeit takes a lot more time to set up for precision cut after cut. What is the max thickness of wood that can be cut? Also, is the cut good enough that it could cut 2 pieces straight enough to glue up? Max cutting depth without rail 2-5/32”, with rail 1-31/32”. With a better blade than the stock one I’m using, and with JMARTEL’s modification I would say yes you can glue up 2 pieces.